A last minute Diwali inspiration - group brass objects and place them at varying heights on a corner table or as a photo booth prop! Images from Deepa's home. Dear Readers - A gentle reminder that our TJ MAXX Home Goods fifty dollar gift card give away is on till October 24th 10 pm Eastern time. You can still enter to win!!!! 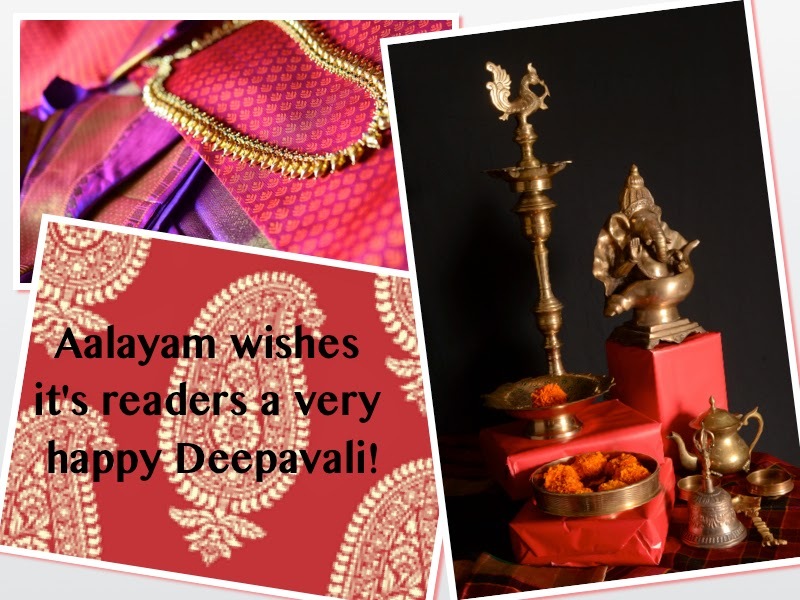 Those of you who joined the Aalayam family recently (after October 14th), please, please leave us a comment with your name as you are eligible to enter the giveaway. We don't want to miss anyone who is eligible. For others who want to participate in the giveaway now (you still have time), here is the eligibility criteria. 1. Join Aalayam as a member and leave us a comment stating you are a new member. 2. If you are an existing member, you must introduce at least one new member to the Aalayam family and leave a comment introducing the new member. You and the new member will both be eligible! 3. And finally! Increase your chances of winning by introducing additional new members. So, if you introduce 3 new members, you have 3 chances to win the gift card! This giveaway is open to readers in the US. Readers in other parts of the world are welcome to enter on behalf of friends and family here in the US. The giveaway will close on October 24th at 10 pm eastern and the winner will be announced in a future post. Good luck! Once again, we wish you a Joyous Deepavali! We will see you on the other side of Diwali with some bone chilling stories! Join us for our Halloween spooktacular then!